I have sold a property at 15 22788 NORTON CRT in Richmond. I have sold a property at 707 821 CAMBIE ST in Vancouver. RAFFLES! In the centre of it all. This is a spacious two bedroom two bath unit with great separation for guests or sharing. Large open kitchen, great for entertaining. Stone counters, stainless steel appliances, rich floors andmodern finishings. This is just the place you will want to call home. Lots of space to work from home. Awesome location minutes walk from the seawall, library, entertainment, restaurants and shopping. It's a perfect match for your downtown lifestyle. YOU'LL LOVE IT! I have sold a property at 3590 23RD AVE W in Vancouver. I have sold a property at 303 2825 SPRUCE ST in Vancouver. VANCOUVER, B.C. – April 2, 2014 – March home sales in Greater Vancouver outpaced last year’s total yet lagged the region’s historical average for the month. The Real Estate Board of Greater Vancouver (REBGV) reports that residential property sales in Greater Vancouver reached 2,641 on the Multiple Listing Service® (MLS®) in March 2014. This represents a 12.5 percent increase compared to the 2,347 sales recorded in March 2013, and a 4.4 percent increase compared to the 2,530 sales in February 2014. Last month’s sales were 17.2 percent below the 10-year sales average for March of 3,190. The sales-to-active-listings ratio currently sits at 18.2 percent in Greater Vancouver, which is unchanged from last month. New listings for detached, attached and apartment properties in Greater Vancouver totalled 5,281 in March. This represents a 9.1 percent increase compared to the 4,839 new listings in March 2013 and a 12.4 percent increase from the 4,700 new listings in February. Last month’s new listing count was 5.9 percent below the region’s 10-year new listing average for the month. The total number of properties currently listed for sale on the Greater Vancouver MLS® is 14,472, a 6.4 percent decline compared to March 2013 and a 7.9 per cent increase compared to February 2014. The MLS® Home Price Index composite benchmark price for all residential properties in Metro Vancouver is currently $615,200. This represents a 3.7 percent increase compared to March 2013. Sales of detached properties in March 2014 reached 1,116, an increase of 19.6 percent from the 933 detached sales recorded in March 2013, and a 5.7 percent decrease from the 1,183 units sold in March 2012. The benchmark price for detached properties increased 4.2 percent from March 2013 to $945,400. Sales of apartment properties reached 1,106 in March 2014, an increase of 12.6 percent compared to the 982 sales in March 2013, and a 7.1 percent decline compared to the 1,191 sales in March 2012. The benchmark price of an apartment property increased 3.8 percent from March 2013 to $375,800. Attached property sales in March 2014 totalled 419, a 3 percent decline compared to the 432 sales in March 2013, and a 16.2 percent decline from the 500 attached properties sold in March 2012. 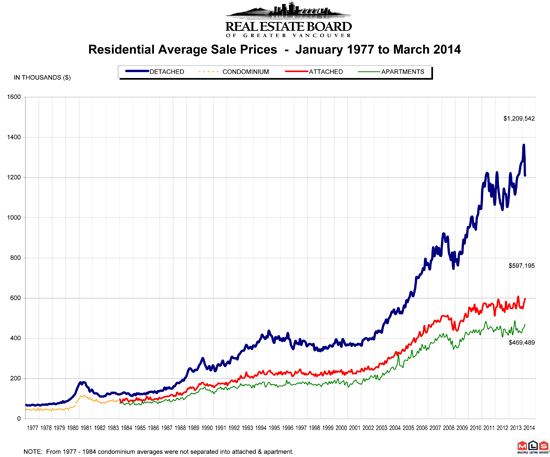 The benchmark price of an attached unit increased 1.3 percent between March 2013 and 2014 to $460,100.